PART 1: GENERAL ASPECTS AND METHODOLOGIES. 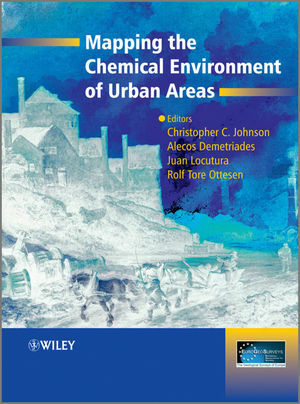 2 Urban Geochemical Mapping: A Review of Case Studies in this Volume. 2.2 Methodologies and strategies for urban sampling. 2.5 Interpreting and presenting the results. 3 Sample Preparation and Inorganic Analysis for Urban Geochemical Survey Soil and Sediment Samples. 3.4 Determination of bulk properties. 3.6 Instrumental analysis for inorganic analytes. 3.7 Application of quality assurance. 3.8 Health and safety issues. 4 Organic Analysis for Urban Geochemical Survey Soil Samples. 4.4 Instrumental analysis for organic analytes. 4.5 Application of quality assurance/quality control. 5 Understanding the Quality of Chemical Data from the Urban Environment - Part 1: Quality Control Procedures. 5.2 Preparing for quality control. 5.3 Operational aspects of quality control. 6 Understanding the Quality of Chemical Data from the Urban Environment - Part 2: Measurement Uncertainty in the Decision-Making Process. 6.2 Estimation of uncertainty due to sampling and analysis. 6.3 Practical detection limit and analytical precision. 6.4 Limitations of the geochemical data set: quality and reliability. 6.5 Effects of uncertainty and probabilistic risk assessment maps. 6.7 Probabilistic risk assessment mapping using kriging. 7 Data Analysis for Urban Geochemical Data. 7.2 Preparations for data analysis. 7.3 Urban geochemistry of Berlin. 8 Sources of Anthropogenic Contaminants in the Urban Environment. 9 Building Materials: An Important Source for Polychlorinated Biphenyls (PCBs) in Urban Soils. 9.3 PCBs in the urban environment: levels and concerns. 9.4 Discussion: the road ahead. 10 Children, Soils, and Health: How Do Polluted Soils Influence Children's Health? 10.2 Sources of arsenic, lead, BaP and PCB in urban soils. 10.3 Exposure, uptake and health effects. 11 Hazard and Exposure Assessment in Contaminated Land Investigations and Environmental Management. 11.3 Hazard and exposure assessment. 11.5 Risk perception and communication. 12 Regulation and Administration of Soil Pollution in Trondheim, Norway: Development of Awareness, Land-Use-Specific Criteria and Local Disposal Facilities. 12.2 Raising awareness of soil pollution in site development. 12.4 Increasing disposal and storage facilities. 13 Soil Geochemical Baselines in UK Urban Centres: The G-BASE Project. 13.2 G-BASE urban geochemistry methods. 13.4 Discussion of G-BASE urban geochemical data. 14 Geochemical Baseline Levels and Suggested Local Guideline Values in Urban Areas in Sweden. 15 Using Geochemical Baselines in the Assessment of Soil Contamination in Finland. 15.2 Geochemical baselines in the assessment procedure. 15.3 Data producers and the national database. 15.4 Example: geochemical baseline data from the Pirkanmaa region and a study site. 16 The Scale of an Urban Contamination Footprint: Results from a Transect through Oslo, Norway. 16.2 Sampling and analytical methods. 17 Urban Geochemistry of Berlin, Germany. 17.4 Land use in Berlin. 18 Environmental Geochemical Survey of the City of Stassfurt: An Old Mining and Industrial Urban Area in Sachsen-Anhalt, Germany. 19 Systematic Urban Geochemistry of Madrid, Spain, Based on Soils and Dust. 20 Urban Geochemistry of Tallinn (Estonia): Major and Trace Elements Distribution in Topsoil. 20.2 Methods of sampling and analysis. 21 Geochemical and Ecological Survey of the Prague City Area, Czech Republic. 22 Geochemical Mapping of Ljubljana Urban and Suburban Area, Slovenia. 23 Geochemical Characteristics of Lithuanian Urban Areas. 23.2 History of geochemical investigations. 23.3 Application of results for health-risk assessment. 24 Advancements in Urban Geochemical Mapping of the Naples Metropolitan Area: Colour Composite Maps and Results from an Urban Brownfield Site. 25 The Lavrion Urban Geochemistry Study, Hellas. 25.3 Sampling and sample preparation. 25.5 Distribution of lead in parent rocks. 25.7 Distribution of lead in overburden. 25.8 Distribution of lead in house dust. 25.9 Lead levels in child blood and teeth. 26 Polycyclic Aromatic Hydrocarbons in Urban Surface Soil in Oslo, Bergen and Trondheim, Norway: PAH16 levels, Compositions and Ratios. 27 Polychlorinated Dibenzo-p-dioxins and Dibenzofurans (PCDDs/PCDFs) in Urban Surface Soil in Norway. 27.2 Areas investigated with an industrial past and present. 27.3 Sampling and analytical methods. 28 Soil Contamination in the Urban Area of Belgrade, Serbia. 28.2 Legal and institutional framework for soil management. 28.3 Availability of soil information for local soil protection. 28.5 Presentation of soil pollution data. 28.6 Engineering geology in the service of environmental protection: Geological Institute of Serbia. 30 Geochemical Mapping of the Denver, Colorado (USA) Urban Area: A Comparison of Studies in 1972 and 2005. 30.4 Sample preparation and chemical analysis. 31 Geochemical Characterization of Soil and Sediments of the City of Beira, Mozambique: A Preliminary Approach. 32 Urban Geochemical Mapping in Nigeria with Some Examples From Southern Nigeria. 32.2 Review of urban mapping in Nigeria. 32.3 Methods used in urban geochemical mapping in Nigeria. 32.4 Urban geochemical mapping in Nigeria: the way forward. 33 Geochemical Mapping of Trace Metal Pollutants in Urban Soils of Hong Kong.